For as long as I can remember, I've been fascinated by videogames. Format or platform were irrelevant to me; if it was some kind of electronic plaything, I was there. I've seen six generations of consoles come and go and watched PCs develop from the humble 486 to the mighty multi-core powerhouses that we have today. It's safe to say that I don't just play games - I'm a gamer. Unfortunately, so is my wife. It may seem strange to use the word "unfortunately." Anecdotal evidence suggests that a significant other interested in videogames is a highly desirable thing indeed. 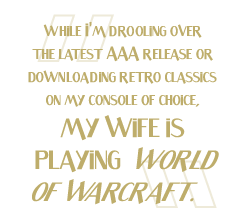 But my wife and I aren't playing the same games; while I'm drooling over the latest AAA release or downloading retro classics on my console of choice, she's playing World of Warcraft. That's right, World of Warcraft, the most successful MMORPG of all time, and depressingly, my biggest rival. I suppose a little background is in order. A couple years ago, I decided that I wanted to give an MMORPG a try, and I'd heard good things about WoW. I even remember joking with the sales assistant that I had "too much of a life" as I bought it. I got home, installed it and began to play. The sense of scale and the adventure of discovering a whole new world quickly drew me in, and I managed to convince a few friends that they might like it too. My wife was the sticking point, though. I often wished we had an activity we could do together, so I suggested that she might like WoW. She was reluctant at first, but after a few weeks of pestering, she agreed to give it a try. We stuck the 10-day trial client on her computer and, one fateful night, both sat down to play. A week later, she was hooked. It was like a switch went on in her brain. Her previous forays into gaming had been quite limited - a little Guitar Hero here, a few games of Civilization 2 there - but this was different. She had found the game for her. It spiraled downward from there. There were plenty of warning signs, even at that early stage. When there was a problem upgrading her trial account to a full account and she had to wait a day or two to get her hands on a retail copy, her annoyance was palpable thing; but like a fool, I ignored it. Part of me saw the game as a way to ameliorate that nagging feeling that I was neglecting her a little. As our small circle of friends drifted away from the game, she became even more engrossed in it as she discovered PvP and then raiding. Fast forward to today: she's still playing it every night while I'm left to amuse myself in whatever way I see fit.